In winter driving conditions, the goal for a trucker is to maintain traction on a slippery hill, when ascending and descending the hill. 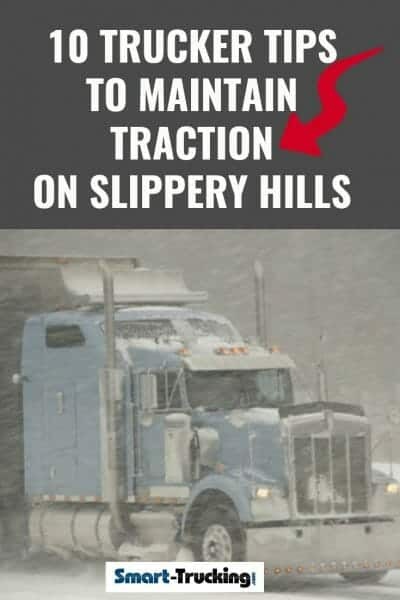 Negotiating a slippery hill in a big rig, is one of the most challenging situations a professional CDL driver will encounter in his truck driving career. Snow covered grades present a whole different driving scenario to a truck driver. There are a few good tricks which I use that you may also find useful. All professional truck drivers should know that speed will just get you into trouble. Maintain control when ascending a grade, just enough speed to get up the slope. When descending, it’s best to creep down, just like you’re walking down the grade. When travelling up a slippery hill, I like to have the axle interlock engaged. The interlock is engaged in order that all the drive wheels are in touch with the drive shaft and the gears. All the drive wheels are then engaged and working to pull the truck up the slope. This helps the truck to maintain that all important traction. I use a combination of horse power plus momentum to get up the hill, so I don’t spin my wheels. If you see the sanders have been out, look for patches of sand to drive on and the wheels will grab on the sand to give some good traction. Another thing I like to do is feather the fuel. Don’t give the truck too much fuel when you’re going climbing a grade, because it could cause the wheels to spin. Just gradually increase the engine power. Never go into a corner too quickly. I’ll keep my RPM’s up a little higher than I normally do because I don’t want to wipe my feet then jump 700 RPM if the wheels start to spin. That way, if the wheels do spin, it won’t become a major spin-out. It’s important to keep up a certain degree of momentum to make it up the grade, but not excessive speed is unnecessary. Keep the engine running closer to the top of its RPM range. By keeping the engine running in this manner, should the wheels decide to spin a little bit, they can only turn a couple hundred RPM before they hit the limiter and then they can’t turn any faster, which would cause an even greater problem for the truck driver. If you’re down in the low RPM, slugging it up the hill and you hit a patch of ice, and all the sudden the wheels jump 600 or 700 RPM, then the wheels will frantically turn. It’ll be all that much harder to regain traction. However, if you’ve only spun at 200 RPM, you can just ease your foot off the throttle a little bit, bring the revs down, and the wheels will probably catch and you can ease back into it again. If when you’re travelling up a hill and you encounter a flat spot, it may be a good idea to pick up another gear and improve your momentum. Keep in mind that control of the vehicle is the focus. As a professional truck driver, you should know that sliding off the road is a definite risk in this situation. If you see a corner when you’re climbing, be aware of your speed as you approach the corner. Do not approach a corner with excess speed. Another good practice when going up a grade, is not to follow the tracks of other trucks up the hill. Chances are, the other trucks will have polished up the road as they travelled over the hill. You’re much better off to cut your own trail for the best traction. Keep a little to the right shoulder. I like to move just a wee bit toward the right hand shoulder of the road. Chances are, there’s gravel on that right shoulder that will help give you a little more of a grip to help you maintain traction on slippery hills. You’ll then travel up the right hand side of your lane, hopefully with your right hand drive wheels in the gravel on the shoulder. Be careful not to get too far to the right. Just stay on the edge of the road try to find that bit of gravel on the shoulder. Sometimes that bit of traction, will be enough to make a difference between getting to the top of the hill or not. Don’t shift too often. When shifting gears and you let out the clutch, that there’s the potential to spin-out. Try to avoid spinning those wheels at all times. When you reach the top of your hill successfully, but there’s a flat spot with a stop sign, this can be a tricky situation. Don’t stop the truck on the hill, but stop at the top of the grade, once the truck has levelled out. If you stop on the grade, there’s a good chance you’ll have difficulty in getting the truck moving again, and most likely, you’ll loose traction and get stuck. Related > Trucker Tips + Hacks For Getting Your Truck UNSTUCK! Use the jake brake. But go down very slowly and you’ll won’t run into trouble. You’ll risk running into trouble if you’re going down too quickly and then have to compensate for your speed, over correct or over brake. You could then put the vehicle into a slide. If you’re creeping down the hill, you won’t get into that situation. Braking should be gradual. You need to check the mirrors to make sure the trailer isn’t starting to jackknife. Use the jake brake as much as you’re able, making sure the unit stays straight. Do not travel too quickly. This is especially important on long mountain downgrades. If the trailer is empty, it is lighter than the tractor, and it may start to jackknife if the tractor receives too much brake pressure. When the trailer is loaded, it often weights twice as much or more than the tractor. Going downhill, the trailer weight is pushing the lighter tractor. Brake when the truck is straight. If you must brake on a downgrade, do it when the truck is on a straight stretch of road. Don’t brake into a curve. The combination of the braking action and lateral movement at the same time on a slippery road, can be a hazard and cause the truck to slide. Do as much deceleration as possible when the tractor trailer unit is pointing straight down the hill. Professional truckers should be well aware of what it takes to keep their rig on the road at all times. Sometimes as in the case of traveling up or down a slippery grade, the situation can definitely be more challenging. However, by moving slowly and steadily, you’ll arrive tractor first at the top or bottom of the grade, as you should.